"The earth has to perish: not the whole of it, but more than half the half of it. The earth will turn into a desert. But God, in peace and tranquility, will stock it over again with a population." [Source: p.79, Prophecies of La Fraudais, Words of the Flame, March 15, 1882]. This event must happen during our watch, in our lifetimes. I encourage you to take a driving vacation through Brittany during the coming months. See the land of St. Anne, the land which has been set aside for us. Getting to France: The cheapest airline tickets will fly you and your family into Paris, however, it is important to realize that there are daily terrorist attempts at either of the two airports in Paris. The military is there to keep order, but these incidents still happen. If you can afford it, going directly into Brittany is best. You can fly or take a ferry. The two international airports in Brittany are in the cities of Nantes and Rennes. Ferries (that take cars and people) also cross over from Ireland and England. You may be thinking of taking a train from another European country into Brittany. However, there are two problems to be aware of: (1) most lines go through Paris – although there is good military presence at the train stations also--, and (2) if you are not used to travel by rail in Europe, the rail system is much more complicated than taking a plane and driving around. This is especially true if you do not speak and read French. About water: Once you land in any city in Europe, your thoughts should be (a) buy bottled water, (b) pick up luggage, and (c) get to train station or rental car offices. Why get water first? Water is most readily (and cheaply) available at the airports (at the stores near the gates) and train stations. Buy a few big bottles and ask for a bag. Strap it to your luggage and go. Renting a car in France: Once in Brittany, you will need a car to get around. These can be rented from companies such as Hertz, Avis, etc. at airports and train stations. Renting from the airport location has the added advantage that returning the car only requires following the airport (plane) signs on the highways and then looking for the rental car sign. Easy!!! Also, check at the car rental agency (most agents speak English) if your car takes gasoline or diesel. The French love diesel (“gas oil”), which does great mileage on roads, but eats it up on the faster "A" highways (the toll booth highways). And opt for that all-inclusive collision insurance which will save you BIG BUCKS if you accidentally crunch a hubcap on those higher stone sidewalks while turning a corner! Some tips about driving in France: Watch Youtube videos about driving in France: look at roundabouts and especially the toll booths. All of the "A" highways have toll booths, approx. 1 euro per 10 km (5 miles). These videos are indispensable, as there are two kinds of toll booths -- one just gives you a ticket and the other kind reads your ticket and charges you for the distance you have driven. Credit cards are accepted and make everything MUCH easier! Get some good maps of where you want to go from your local travel shop, or look online. The Michelin Map Book of France may look like a deal, but the print is REALLY small!!! Consider detailed maps which focus on cities and their environs. When planning your route, you can choose "D" highways which are more scenic, go through the small towns, and which do not charge tolls. Also, making long driving trips on Sundays is NOT great: There is an automated chain of gas stations directly to the side of most highways, but finding somewhere to eat is impossible, as everywhere is closed. Only the bigger cities that cater to business travelers and tourists have eateries which are open on Sundays. Where to stay: It is best to stay near an airport for your first visit, at least for a night or two. That way, finding your way back (even in the dark of night) is easy because of the highway signs with a plane on them. Alternatively, the nearby town of Blain (which borders the hamlet of La Fraudais) has at least one hotel or "alberge". About food availability: Perhaps you have heard that Europeans tend to pack food in their luggage? This is smart travelling. Pack some crackers and other food that will not go bad without refrigeration, so that if you are caught short and cannot find food, you can still eat something that night. Also, a restaurant in a hotel, that also serves breakfast, is a REALLY good idea. French eateries are just not as easy to find as they are in North America. And the French hotel rooms do not have fridges, microwaves, or coffee pots. Getting to La Fraudais: Plan this trip for a Saturday, as this is the day that the shrine is open to pilgrims. The best road going into La Fraudais is the N171. It is best to take it from Rennes, off the N137 highway. So I would rent a car at Rennes (airport or train station). The N137 highway connects Rennes (to the north) with Nantes (to the south). But the N171 that goes past La Fraudais (look for a small white sign on the right hand side) only has a west side on-ramp from N137. So if you are coming from Nantes, you have to pass it and double back to get onto the N171 turn off. A word about Google Driving Directions: If you increase your cell phone "data" for your trip with your telephone company, you will not be charged an arm and a leg for using google driving directions. This is a great tool! You type in the address you are going to, touch the Start arrow, and the satellite finds your phone/car, and then vocally guides you in. If you have a person to act as navigator, this can also be helpful, as they can read the map and make sure that you are going in the right direction. A word to the wise, turn off the microphone on your phone, or else your conversation with others in your car can activate a change in travel destination which you were not planning for!!! About food, water, and gas near La Fraudais: Along the N171 (past La Fraudais) is the Hyper-U. It has gas pumps, and it has the big supermarket that is also a department store. You can get just about everything here. There is a small cafe and the bathrooms are first rate!!! Basically, it feels like you are shopping at home. If you forgot to pack scissors and you need help to open the packaging of something, go to the Customer Service counter (near the front doors) and they will help you! Checking out Brittany Real Estate: For real estate, you can walk around the small downtown in Blain, and look for the real estate companies, (pictures of properties for sale on their windows) or you can look up Notaries "Notaires" online through google.fr, email them, see if they can communicate in English, and then set up an appointment before you go. Again, use Google driving directions to get there! I hope that you do go to see the land of St. Anne this year. 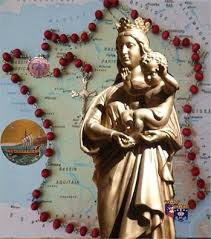 Her shrine is in the city of Auray.